In Jewish lore, stories are told of human-like beings created from clay and animated by holy men. Called “golems,” they were said to often be used as servants by rabbis (pronounced 'rah-bai' - a Jewish holy man) in the Middle Ages. The reason the rabbis could create these creatures was that the holy men’s studies of religious matters brought them very close to their God, and this fact bestowed upon them some of God’s abilities ― which included creating life from inanimate matter. But make no mistake: rabbis, though holy, are still just men... and so their creations cannot be as perfect as their God creates. No matter how human a golem may look, they are not; they cannot make choices themselves, and follow their orders blindly with no thought to consequences. Also, golems cannot speak; for doing so would make them too human. Later legends added details on how the golems were constructed. First of all, golems are always sculpted from clay; this is because Jewish belief states that the first man created by God was also sculpted from clay. The actual magical techniques for animating a golem are secret, but clues are said to be hidden within the text of an ancient Jewish book called the Sefer Yetzirah (Hebrew for “Book of Creation”). What is commonly known is that to finally animate the figure either a magic word was inscribed on the head of the golem, or a magic phrase was written on paper and placed in its mouth. To “kill” the golem, the magic word or the paper was simply removed. The best known golem legend comes from the city of Prague in the Czech Republic. It is told that in the 16th century the Emperor of the country passed an edict calling for the expulsion or deaths of all the Jews in Prague. It is told that a rabbi named Judah Loew ben Bezalel [1525-1609 CE] responded by creating a large golem from the clay of the Vltava River. He performed the necessary rituals, and inscribed the golem’s forehead with the Jewish word “emet” (“truth”), bringing it to life. 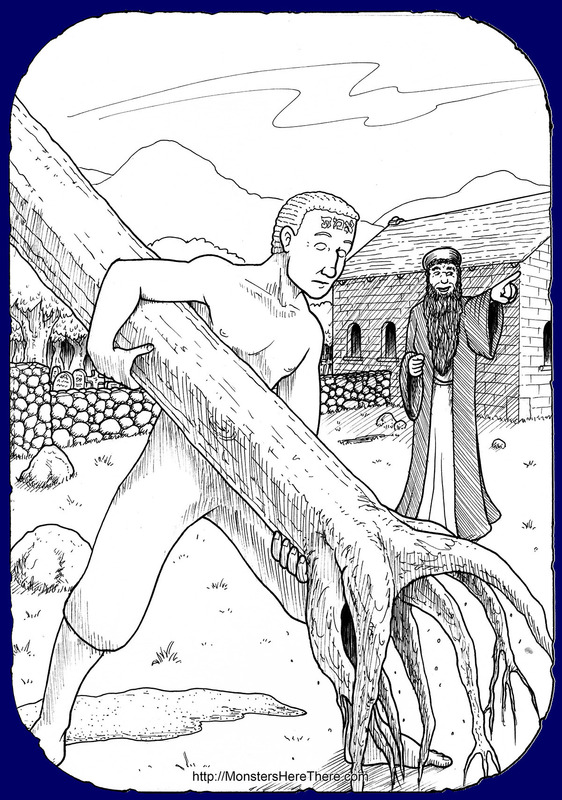 Rabbi Loew wanted the golem to merely protect the Jews in the city, but the creature became increasingly violent. It began to kill the non-Jewish citizens... and some say that the golem also turned violent against the Jews of the city, and, worse still, the creature began to grow. One possible reason for this change of behavior may be that Loew was not allowed to use the golem during Sabbath, a sacred time once a week when Jews are not allowed to perform any work. Loew was in the habit of removing the magic word from the golem before Sabbath started and replacing it after Sabbath ended each week, so the golem could do no work. One night, however, Loew is said to have forgotten to remove the magic word... with the result that the golem went berserk as the Sabbath started. Whatever the reason, the golem became a problem for all residents of the city... but it had the desired effect. The Emperor, terrified of the golem, begged Rabbi Loew to kill it and promised to end all unkindness against the Jews. Loew accepted this offer and changed the word on the golem’s head from “emet” (“truth“) to “met” (“death“), ending the golem’s artificial life. Being no fool, the rabbi warned the Emperor that the golem would be kept in the attic of the Old New Synagogue in Prague, in case it was ever again needed. Not surprisingly, the Emperor never gave Rabbi Loew another reason to use the monster... it may still be in the attic of the synagogue today. "Legends of the Synagogue," article in All The Year Round (New Series), edited by Charles Dickens, no. 790, Saturday, January 19, 1884. pg. 203. Online: Click Here! "Topics of the day in the Talmud: Artificial Life," by J.D. Eisenstein, article in New Era Illustrated Magazine, Vol. 7, Issues 1-2, 1905, pg. 52-53. Online: Click Here! Spinoza: a novel, Volume 1, by Berthold Auerbach, translated from German by E. Nicholson, 1882 Henry Holt and Company, New York, USA. pg. 216-217. Online: Click Here!